Why use organic body care products? Most of us don’t give much thought to the products we use on our skin as much as to the food that we eat. Yet our skin is highly absorbent and what we put on it also ends up in our bodies. Substances absorbed by the skin go directly into the bloodstream, bypassing the filtering system of the kidneys and liver. These two organs play a crucial role in assisting the body to process and filter out toxins. Unfortunately, many of the ingredients contained in personal care products such as shampoos, lotions, soaps, and perfumes are hazardous, toxic, and have adverse effects on our health. These industrial chemicals are routinely used as the basic ingredients in cosmetics and personal care products!! In addition, 22% of all cosmetic products may be contaminated with impurities that are known carcinogens (www.ewg.org). These substances are not only linked to cancer, but also to hormonal problems, nervous system disorders, impaired fertility and disorders related to the reproductive system. The toxins that we use in our everyday lives have far-reaching effects. Many of the ingredients that are used in pharmaceuticals and personal care products (PPCP’s) have been found in the environment. Some of these substances have also been shown to be harmful to wildlife, fish, and other marine animals due to the phenomenon of bioaccumulation. Bioaccumulation is what happens in the tissues of an individual organism (such as an animal or human) as a result of increased levels of substances such as pesticides being absorbed from food or water. Think about it: Every time we wash our hands, take a shower, brush our teeth, or spray perfume, we are putting substances into our air and water supply and eventually these substances find their way back into the earth and into the atmosphere as well. If the products we use contain hazardous or toxic chemicals then we are not only putting our own health at risk, but we are also contributing to the pollution and degradation of our planet. Yet for those of us striving to live a more natural and organic lifestyle, it can be a complicated matter to wade through all the greenwashing to find products that are genuinely organic and eco friendly. There is a great deal of controversy in the organic and personal care industries regarding truthful labeling practices. Organic body care products should avoid the use of all toxic ingredients. However, not all products labeled “natural” or “organic” – even the popular brands that are found in natural health food stores – can live up to the organic claim. Many companies claiming to sell organic body care and cosmetic products are not adhering to organic standards and are in fact misleading consumers by using synthetic ingredients that are known to have toxic properties. Some of the more prevalent toxic ingredients include: phthlates(pronounced thay-lates), parabens, petroleum based products such as petrolatum, mineral oil, and paraffin, BHT(butylated hydroxytoulene), propylene glycol, hydroquinone, lead acetate, toluene, AHA’s(alpha-hydroxy acids), and sodium lauryl sulphate. So what should you look for when shopping for organic body care products? First of all, avoid products that contain hazardous, toxic, and synthetic chemicals. Use our toxic ingredient list as a guide when you go shopping and read the labels on every product. Look for organic certification labels on the products themselves. This is the only guarantee that what you are buying is truly organic! By law, all genuinely organic products must be certified organic in order to make this claim. Don’t be misled by fancy packaging or deceptive advertising. Be wary of products that are described as “all natural”, “pure”, “unscented”, and “hypoallergenic”. These are meaningless descriptions that do not necessarily refer to an organic product. Avoid products that have been tested on animals. Ideally, organic body care products should be created only with natural organic ingredients. Look for products that contain real botanicals, plants, herbs, flowers and essential oils. Organic products basically need to contain organic food ingredients; that is the definition of certified organic. Read the ingredient labels as if they were food labels. Get in the habit of doing this every time you shop. Remember, this stuff will be going on your skin, on your family, on your children and getting absorbed into your bloodstream. You don’t want a diet of toxic synthetic chemicals!! 1. Complain to the manufacturers; tell them you won’t buy their products and explain why. 2. 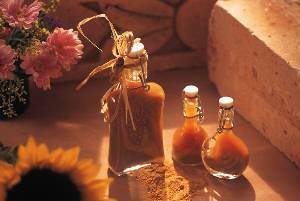 Learn to make your own skin care products. 3. The Organic Consumer’s Association (OCA.org) has a campaign called Coming Clean. Its purpose is “to establish strict organic standards for body care products”, the same high standards that apply to organic food. Learn more about what you can do to support their campaign here. 4. Looking for information specifically about men's skin care? Find some great articles and resources right here. 5. Check out ANB Portal (All Natural Beauty Portal) This is a great resource providing information about going a natural way with your beauty care, suppliers of all-natural beauty products, as well as service providers that use natural products. You’ll also find recipes, glossaries, a forum, and links. Click here to return from Organic Body Care to Green-Organic-World.com's Home Page. Copyright © 2007-2011 Green-Organic-World.com. All Rights Reserved. Disclaimer: The content provided on this website is for informational purposes only.